5 Ways to Enhance Feeding Time. Since food is a pretty strong motivator, we might as well make the most of these occasions! Life is busy! That is no secret for most of us. We're busy running from one task to the next and inundated with more lines on the 'to-do' list than we can easily keep up with. Having a multitude of tasks on the list makes it easy to come up with excuses about not having enough time to train the dog. But there is one obligation we dog owners have twice a day that provides us a decent opportunity to make strides in our dog's education. Each morning and each evening we go through the routine of feeding time for the dog. Since food is a pretty strong motivator, we might as well make the most of these occasions. Taking advantage of feeding time to do some training assumes one important factor -- that the dog is hungry. If you free-feed, meaning you leave food freely accessible to the dog throughout the day, it is hard to guarantee hunger during specific times. 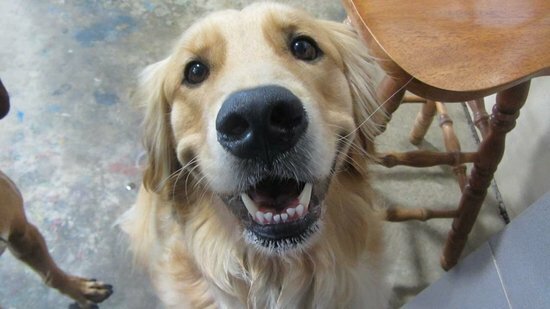 If a dog is satiated, due to having constant access to food, it is nearly impossible to use it to motivate for desirable behavior. Unless it is ill advised by the dog's veterinarian, I suggest going to a timed feeding schedule for a few days before beginning the suggestions below. Timed feedings mean putting the food down for the dog and leaving it available for only 10 minutes or so before removing it. Dogs that are new to the concept of timed feedings will miss a meal or two before catching on to the concept that the food is no longer constantly on tap. Once you have established a predictable eating habit, you can use the motivation of hunger (and subsequent reward of food) to teach the dog some more appealing manners. 1. Ration the kibble into two halves. 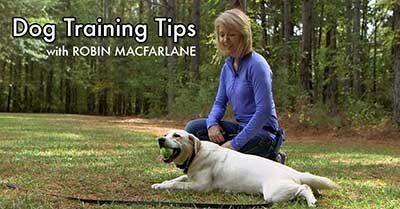 Use the first half to work the dog through a series of behaviors. They can be any behaviors, Sits, Downs, small Heeling patterns, or a variety of tricks, but essentially ask the dog to DO something to earn the food rewards. After 5-10 minutes of work, allow the dog to enjoy the remaining half without any extra fanfare. 2. Help your dog learn to be trusting around the food bowl. Possessiveness is a natural instinct to most of us, including our dogs. Not many of us want to willingly hand over a coveted item if we have any hesitation about getting it back. Our dogs are no different. Many feel apprehension about approach near the food bowl. Instead of charging in to take the bowl in hopes of "teaching the dog a lesson", try approaching and toss additional kibble on the ground or offer up more appealing fare such as a few left over bits of chicken or steak. 3. If you've short changed your dog on exercise and mental stimulation you can make up for it at feeding time by using one of the many food "puzzles" that are on the market. These are designed for multiple reasons including to slow down the dogs that gulp food and thus end up with digestive upset due to swallowing so much air while eating. Puzzles and food dispensing toys are a way to turn a 1-minute feeding into a 15-minute exercise in creative thinking for the dog. And if you don't want to spend the money on a new dog item, toss the kibble out in the grass and let Fido forage for it. His nose will lead him to each little piece and the exercise of having to hunt for a meal helps satisfy the bored dog who needs a job. 4. Start building better recall skills. Instead of putting the food in a bowl and placing it on the floor, keep it with you. Preferably concealed in a pocket. Call the dog to you and reward with a few bits, plus scatter several pieces on the floor to busy your pooch as you move away to another part of the house/yard. Call him to you again and repeat the process. This is a quick 5 minute routine that helps your dog associate the idea that coming to you when called means good things are going to happen. 5. When you are really running short on time there is still one behavior you can teach to your dog during feeding time. To simply Sit and stay until released. Have your dog Sit while you fill the food bowl. Each time he moves, stop the process of filling the bowl and remind Fido to Sit. Once you have reliable staying behavior, use a release cue (Ok, Free, Break) to indicate the dog can move and go ahead and eat. Next move on to a higher expectation and teach the dog to maintain the Sit until you get the bowl placed on the ground. Instead of giving the release cue once the kibble is in the bowl, begin to place it on the ground. In all likelihood your dog will break position when you move the food toward the floor. Simply stand back upright, food bowl still in hand and remind the dog to Sit. Repeat this until the dog maintains position while the dish is set on the floor. (It will take a few reps, but dogs catch on FAST to the idea that the bowl moves out of reach if they shift.) Gradually lengthen the duration between placing the food on the floor and the timing of the release cue. Teaching your dog some patience is never a bad thing! Next Article: "But my dog doesn't like it." Pull-Quote= Food is a strong motivator, so we might as well make the most of feeding time.